Japan is renowned for its unusual museums. 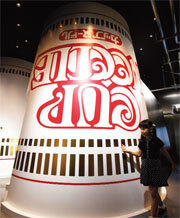 The latest is a museum that pays tribute to the instant snack, cup noodles. The styrofoam cup of precooked noodles was invented in Japan. Last year it was scoffed, slurped and swallowed 95 billion times around the world, as per The Star Online. At the museum children are encouraged to create own noodles, design cups and assemble own toppings—and there are 5,000 combinations.